The barbershop has been slowly fading into a place of the past, only rarely shown on TV as a symbol of the bygone era. 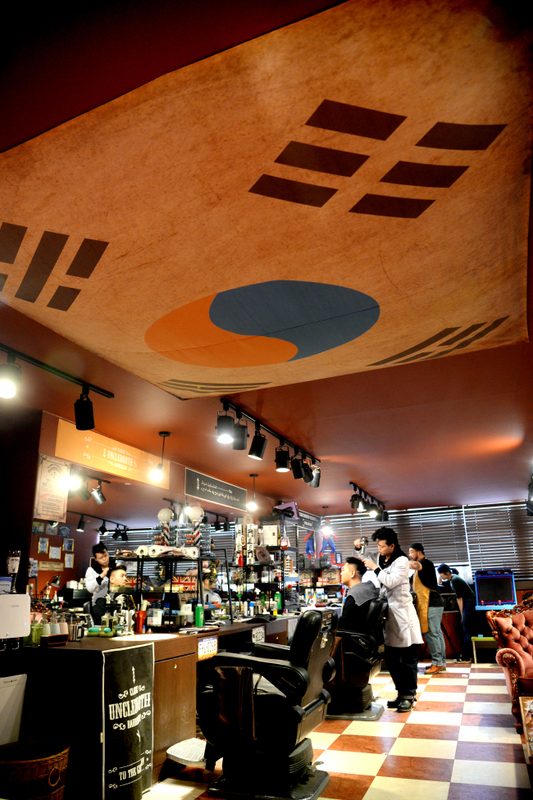 But there are signs of it being reborn into a hip place for Korean men. The revival of the barbershop is being driven by a set of carefully redefined features and services reserved for male clients. 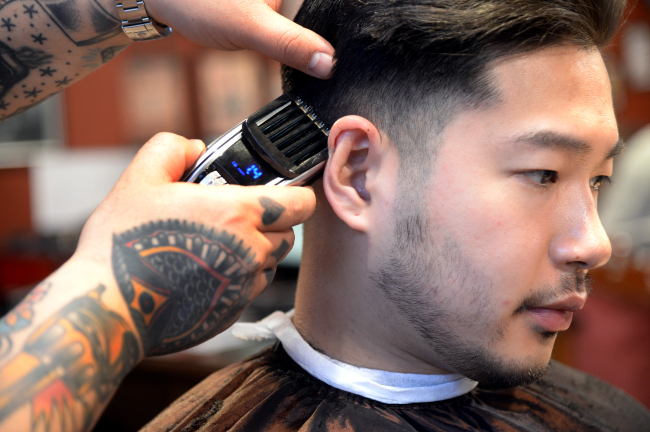 One factor is a pressure-free interaction atmosphere between customers and barbers. “Older barbers in our parents’ time even knew how many pairs of chopsticks the customers owned,” said Jin Min-joon, CEO of Uncle Booth (www.unclebooth.com), in an interview with The Korea Herald, referring to an old Korean idiom describing the casual intimacy at a barbershop chain. First of all, more and more clients are craving edgier and refined “manly” haircuts, taking cue from modern trends. Undercut hairstyles, widely known as a “two-block” haircut in Korea, and classic hairstyles that involve applying pomade are gaining ground here. This new trend is fueling the male grooming market. Moreover, barbershops are selling culture in addition to a hair service. At Uncle Booth, clients can shoot pool, play arcade games and Play Station 3. Jin said he installed a billiards table and gaming consoles to create an atmosphere where everyone can relax, including the employees. Regular customers are also drawn to the comfort at barbershops. Male customers appear more relaxed in their interactions with barbers compared to those with hair designers at beauty salons normally reserved for female patrons. Male-to-male gossip is a plus for the customers at barbershops. 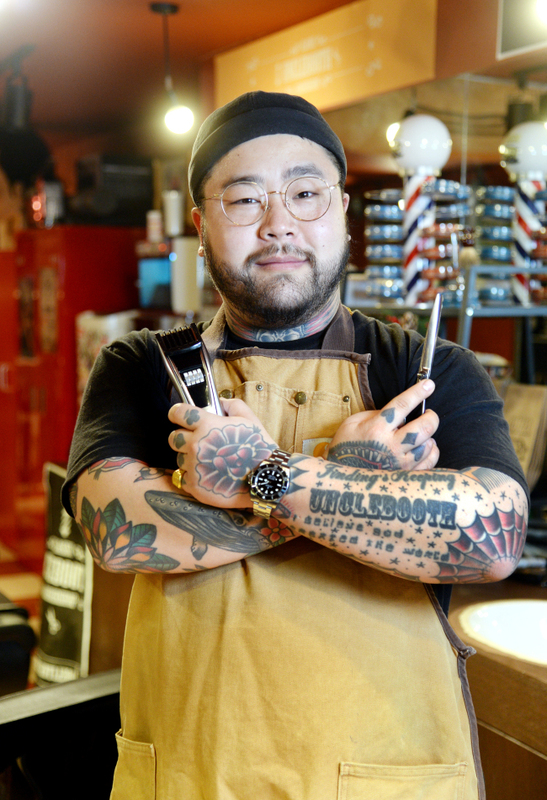 “Barbers were the friends to openly talk to about anything, and we try to recreate the same experience at our shop,” said Jin. Besides the friendly atmosphere, barbershops offer different styling options from hair salons. Barbershops focus on neatness rather than flashiness. At beauty salons, it is common to walk out the door with a hairstyle used by a celebrity, only to realize that they do not look like one. Another important difference is that traditional barbers are against applying chemicals on clients’ hair. They first carefully examine clients’ facial shapes and hair types, then recommend hairstyles that will suit them most appropriately without breaking the hair structure. Instead of imitating a Korean idol’s hairstyle, for instance, barbers often offer a haircut that is better suited to individual customers. “It’s like a tailored suit. We tailor clients’ hair,” said Jin. At barbershops, clients can discover the perfect blend of the classic and the contemporary without having to damage their hair. Jin said he originally began his career as a hair designer, not a barber. “My dream was to become an auto mechanic, but it was difficult to make a living with one particular skill, so I also learned hairdressing skills when I was 19,” he said. Prior to starting his own barbershop, Jin realized Korea was lacking hair shops dedicated only for men, unlike other countries such as Japan and the US. He bid on the growth of the industry in Korea and earned the barbering certificate at a beauty school in Seoul. He is now running the very beauty school as CEO, aside from his stint with Uncle Booth. Though fairly small compared to the beauty salon market, barbershops are steadily gaining popularity. At the beauty school Jin runs, the number of trainee students graduating every three months has grown over tenfold from 8 to 100 in the past few years. And Uncle Booth in Yeongdeungpo, Seoul, draws some 400 customers every month. For those who are hesitant to pay visits to a barbershop, associating it with the stereotypical slick, short and shiny hairstyles, Jin said that customers are advised not to relate barbershop with an extreme hairstyle, and encouraged them to have a consultation at a nearby barbershop before the maiden trip. Here are some general hairstyle suggestions for barbershop-newbies from barbers. For people with elongated faces, barbers recommend the undercut with a fringe or slicking the hair back to compensate for the lengthy faces. A person with a round face should opt for a pompadour or a quiff to add a few centimeters on top with the sides cut tight to balance out the roundness. Men with oval shaped faces are lucky in that they are likely to pull off any hairstyle. In terms of the hair type, thick hair is more desirable than fine hair. Gentlemen with thick hair can rock both short and long hairstyles depending on their face shapes. Those in possession of fine hair are advised to leave the hair long to add volume and weight to it. If cut short, their heads might appear too empty. Uncle Booth offers a simple all-in-one service which includes a haircut, shave and pomade styling for a set price, though a discount price applies to those aged over 60 or kids under six.